Sen. John McCain (R-Ariz.) said Monday he feared a “stalemate” has developed in Libya that would lead to a more radical government in that country. McCain, the ranking member of the Senate Armed Services Committee, said the U.S. should revive its air attacks to incapacitate forces loyal to Moammar Gadhafi’s regime. OK, maybe some of my more hawkish friends will have no problem with Crazy Cousin John’s dubious use of the first-person plural (“we can succeed”), but exactly how much bombing does he suppose will be necessary to allow the half-assed Libyan rebels to defeat Qaddafi? Tuesday will be the one-month anniversary of the start of “Operation Odyssey Dawn,” and in the past four weeks the rebels have demonstrated their absolute dearth of military ability. You could assemble any random group of 2,000 JROTC cadets, issue them the same weapons possessed by the Libyan rebels and expect a better results. After the relatively quick and easy ouster of Mubarak in Egypt, Obama got the idea that Qaddafi could be overthrown just as easily. The French were, for some unknown reason (perhaps related to Sarkozy’s domestic political situation), very eager to see Qaddafi overthrown, and started militating for a NATO-led intervention. With little or no accurate intelligence about the Libyan rebels, and with a U.N. Security Council mandate for “humanitarian” intervention, Obama then approved a limited short-term U.S. military action, thinking that would be sufficient to tip the balance against Qaddafi. Well, guess what? It was a bad idea. Either we go to war or we don’t. You can’t halfway fight a war. Either we should have resolved to do whatever was needed to overthrow Qaddafi, or we never should have gotten involved in what is, after all, somebody else’s civil war. And another thing: Odyssey Dawn? What the hell kind of name is that for a military operation? Sounds like a disco cover band in lime-green leisure suits playing the Holiday Inn circuit in 1975. Leave it to the Europeans and blame it all on Hillary Clinton. 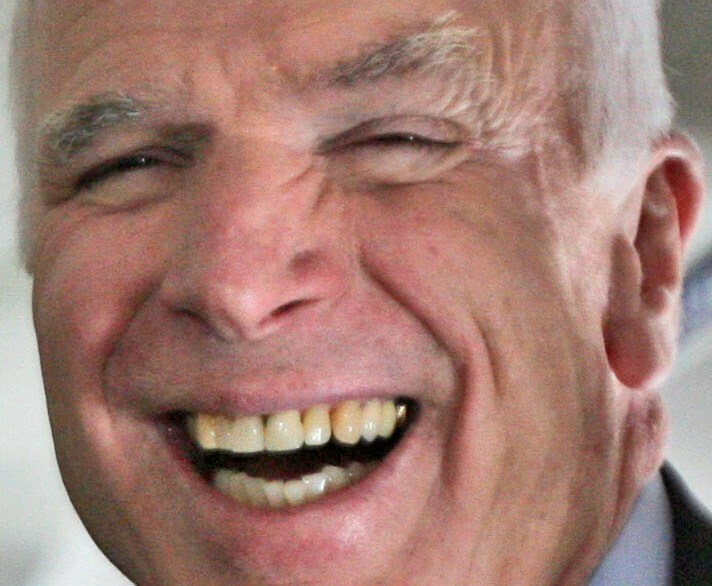 Whatever you do, Mr. President, don’t listen to John McCain. He’s crazy, you know. Don’t Blame Me, I Voted for Bob Barr! I’m hoping someone can help me. I left on vacation last week, and when I got back, an entire war was missing. . . . Although I’ve found hints that it still exists somewhere, President Obama’s Libyan War is officially missing in action. Exactly. If Obama’s Excellent Libyan Adventure had led to the quick toppling of Qaddafi and the liberation of Libya, the MSM stood ready to pronounce this a stunning triumph for the Commander-in-Chief. Now that it’s beginning to look like a complete botch, they can scarcely be bothered to notice.